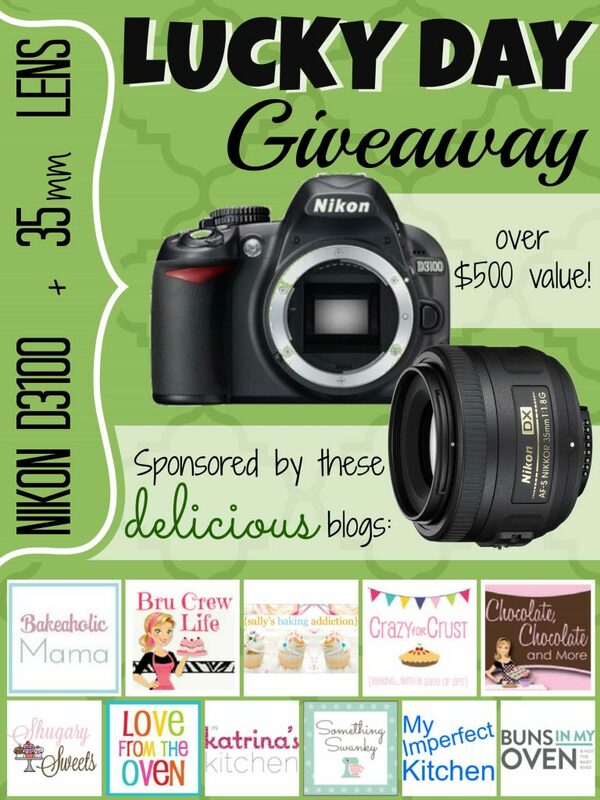 Nikon D3100 + 35mm Lens #giveaway - Chocolate Chocolate and More! Yes you saw that right! A great group of bloggers have gotten together and we’re giving away a CAMERA! A Nikon D3100 and a 35 mm Lens. All the specs on the camera and lens are at the bottom of the post. This is a dream camera to have. Fully automatic or if you know what you’re doing you can take it off auto and the possibilities are endless. I could keep going on about how awesome this camera is but you’re here to enter the raffle so here you go! Entering is easy. Just click on the entries on the rafflecopter. Happy clicking and good luck! Fantastic giveaway from an amazing group of bloggers! I killed my husbands camera, dropped it in the lake while we were fishing. I could really use a replacement. Plus I have a new grand daughter and my son is graduating from high school soon. Thanks for this opportunity. I would absolutely jump up and down and pee my pants to have this camera 😉 tehe. I’ve desperately always wanted a big, fancy camera to shoot amazing pictures with. This would make my year…or two! I do not have a good camera. I love food, grandkids and nature so I would taking more pics of all the things I love. Thanks so much for this giveaway! My kiddos.. and stuff for my blog! I would give this camera to my sister who is a photo buff. Thanks so much for the giveaway. I’m a Twitter follower. I would use this camera to snap photos of desserts! I would love to take it out in the woods and take pictures of everything I see.. Happy St. Patrick’s Day! I’ve been wanting a new camera for awhile. How lucky would I be if I won one. Fantastic giveaway! A new camera is an awesome thing to win. I would use the camera and lens to photography food, nature, people, and lots more! Blog photos and pics from my garden. 🙂 Thanks, Ladies, for a wonderful giveaway. Happy St. P’s Day! Our family camera is an old sony P&S that we bought second hand almost 7 years ago! I’m thinking that I might not be the horrible photographer that I think I am…but I am the cheapskate that I know I am:) oh I hope I win! It would be great for improving my blog photographs but I would love it for family pictures as well. Thank you all for an awesome giveaway. If I won this camera, I would use it to begin doing nature photography with my daughter during our spare time. We love taking walks in the wilderness so this would give us something to remember those special father-daughter moments. The last camera I bought was a D50! This would be a nice upgrade for my photographic pursuits. I would photograph my friends and family as well as stuff for my blog!! I’d take pictures of our family, and the scenery when we travel. I’d photograph food of course! I would use it to photograph my children. Would love, love, love this camera. Used to take all kind of photos with my old Nikon film camera….but times they have changed and I need something to take my food photos with other than my grainy cell phone. I would totall love to learn more and take great picture of my kids. If I win this camera, I could finally improve my pictures!!! That’s an awesome giveaway! I love photography, and this is a great new camera to capture my 2 year-old. Joan, I am praying hard to win this!!!!!!! Awesome giveaway!!!! I’d give it to my hubby. It’s his dream camera. I would use it to photograph craft projects. I would give it my nephew as a late present. I’d use it to begin my side job that that I have been waiting to start and then of course, use it daily for great pics of my daughter, family and other fun things we do together. I will use it to photograph my first grandchild coming in June!! I would love a Nikon Camera! I would photograph my grandchildren. Thanks for this opportunity. I would love to win this great camera.I would take losts of pictures of my grandkids and family. Thanks for offering this great giveaway. I have been in need of a good camera forever now to photograph my products I sell! This would be so awesome, thank you for the chance to win one!!! I NEED a new camera so badly, I would love to win! Thanks for the chance! I would photograph my family and pets! My daughter and I have been talking about taking a photography class together. What an amazing camera to learn with! Doesn’t get better then Nikon! My first quilt that I am currently working on! Excellent give-away for someone who owns a really “old” camera! Thank you! I would photograph wedding festivities for my BFF and my sister! I’ve been married for nearly 3 years and we do NOT take pictures! I hate it!! I want to have tons and tons of pictures to look back on when we have kids and go “Oh. That was nice.” lol! And I want to get lots of practice in so when we DO have kids, I’m not dependent on the auto setting to take pictures! I would photograph my children, clients, and scenery with this camera! I would photograph my children….. everyday, birthdays, holidays, sports!!!! I am a freak when it comes to taking pictures! I have wanted a NICE camera for the last 2 years and every time I am about to purchase one something else comes up. I would LOVE to win this. I would take pictures of my baby. I would work on the cookbook I want to publish of my Mom and Grandma’s recipes! This is amazing! Would love to have a really good camera to photograph every day life and its beauty. Oh I would love to win this – I’m dreaming of the day I can afford a dslr. I’d photography EVERYTHING! Seriously, if I had a camera like this I would take pictures of any old thing. I would take pictures of EVERYTHING! I’d use it to photograph all the unique, hidden things I find in everyday life. I love to take pictures of nature/ garden, my baby grand-daughter and it would be really helpful for listing things on ebay! I’d photography my friends and family! I would use this to take picture for my blog! This would be great for taking before & after shots of projects! I would use this to take pictures of my 3 kids! If I were to win this wonderful camera, it would be well used. Recently I’ve grown nostalgic thanks to our box of home-videos, our amateur movies and childhood preserved on film. My sisters and I, one of which has a three year old now, have all expressed a burning desire to go back to making short films and capturing every day in its entirety (something we’ll thank ourselves for in the future, as we do now to our young selves). But there’s also the photographic aspect which I’ve become intensely interested in, to the point of spending the entire night researching and teaching myself about photography. I’m also determined and excited over starting a YouTube channel, something that requires a decent camera. To add one last thing, these next few months will be extremely busy and I’ll be going to dozens of new places. I want a camera to make this vacation memorable, I don’t want it to fade from my mind or turn into a murky memory too frustrating to even bother trying to recall. For the past few months I’ve be indecisive over which camera to purchase, but I’ve *always* gone back to the D3100. The fact that this opportunity popped up on my Pinterest page after a long day of looking over refurbished Nikon cameras seems almost like fate. My family, our travels, and the food I blog about. My family, my friends, hopefully future clients and their families. I would use this camera to take pictures of everything, especially my cute little nephew. Hi- I need a new camera soooo bad, I would take pictures of my family, friends and all our critters! I would LOVE to use this camera to take pictures of my fuzzy critters and various aspects of nature! It would also be great for my trip to Europe this summer! Totally want this to take pics in NYC! If I win this camera, I’d take photography classes to learn how to take professional pictures. Might just be a new career 🙂 I desperately need a new career! I’d love to win this camera to photograph my family (mainly the kiddo and the dog) and also, since I’m a food blogger it would be great for snapping pics of new recipes! My baby girl! Thanks for the great giveaway!!! A perfect camera to win and replace my 5 megapixel!! i will use this camera for taking pictures of delicious deserts and sweet dishes and also photograph nature. This camera would replace my D3000 that I have worn out in the last 3 years that I have it. I shoot on average 3,000 pictures on a 4 day vacation with my almost 8 year old daughter. I love photography, and the Nikon D3100 would just add to my addiction! I would use it to take pictures of all my food! Oh my…great giveaway…I would use it to start really taking fantastic photos for my blog! I would take pictures of all the simple things in life that are the most beautiful..yummy food, my poser cat, the beautiful spring changes, the timeless beauty of old age I see creeping on my parents..and so many more! I would take pictures of my family! We don’t take near enough pictures, but it’s important to capture those memories that we make together. I would love to photograph my sweet little girl! I would love this! I’m slowly getting better with my entry level DSLR and would adore an upgrade! I would use this to take pictures of the food I cook to make a recipe book! and photos of my family of course. I would use the camera and lens to take pictures of my sister in the woods behind our house, for my photography instagram and tumblr that I am making. I would finally be able to photograph my nails for my blog with a quality camera! My brother is an event promoter, I would use this to photograph the events for our website. I would love a new camera! And that one would make me very happy. Kids, Food, Travel, Life~ Great giveaway! I would use it to photograph everything … I would Love to win this so I could get great shots for my food blog.